Good news! Scrapes and dings on your gorgeous wood floors are totally preventable. One of the easiest ways to protect wood floors from scratches and other damage is to decorate them with an area rug. Area rugs provide a protective barrier against furniture legs, foot traffic, and pets while adding style to any floor in your home. Use the following steps to decorate with area rugs in a way that keeps your wood floors looking healthy and beautiful. Hallways, entryways, and mudrooms are normally high-traffic areas where wood floors see more wear and tear. Use runner rugs in these areas to guard the integrity of the hardwood against shoe scuffing and debris brought in from the outside. Walking on an area rug that has been placed over a dirty wood floor can grind existing dirt, dust, and sand into the wood. So that nothing comes between you and your rug, sweep and mop the entire area first to prepare the floor. Fix any scratches with wood wax or filler before laying your rug down. For the best results, clean under your rug regularly throughout the year. One of the worst things you can do to your poor hardwood floors is lay down a rug with latex backing, which is usually found on natural fiber rugs. Latex traps moisture and gases that can stain and strip your hardwood’s finish. Do your floor a kindness and preserve it by investing in a rug with a woven backing. 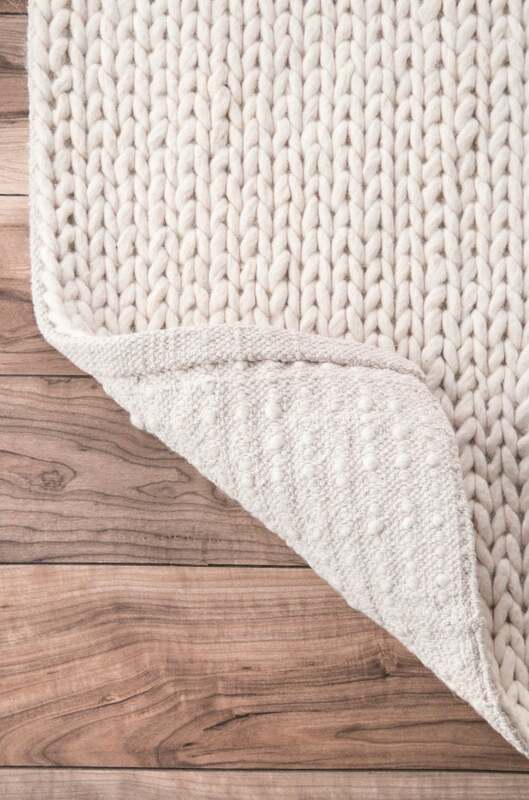 Wool rugs are safe for hardwood floors because they allow plenty of air to move through their breathable fibers. A puddle from an umbrella or dog bowl can quickly go from a temporary nuisance to a permanent problem. It doesn’t take much moisture to waterlog a once-beautiful hardwood by seeping into its seams and either staining or swelling the floor. Be prepared with a waterproof floor covering. The best rugs for hardwood floors keep them safe and dry. To really nail your floor protection, make sure your rug doesn’t have color or dyes that will bleed through when dampened. Wool and synthetic fiber rugs tend to be waterproof and colorfast. 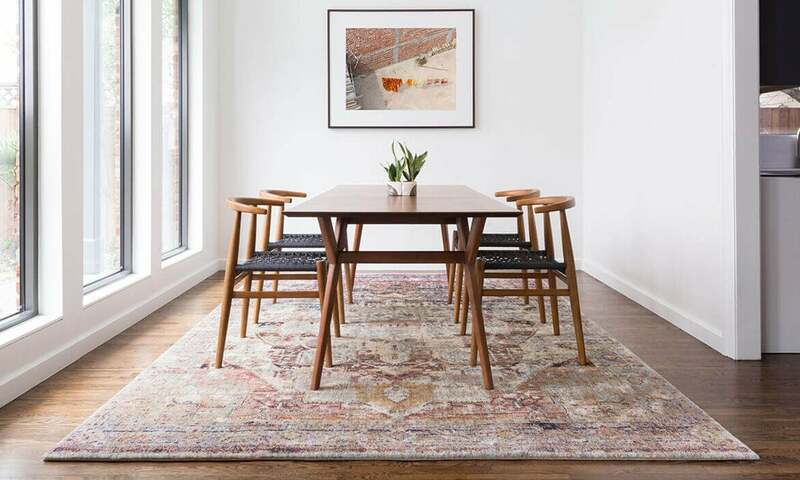 An oversized rug anchored by furniture is suitable for a living or dining room — but beware. The hardwood preserved under a large rug will maintain its color better than the wood around it. To prevent discoloration on your uncovered flooring, try to limit the amount of direct sunlight your hardwood is exposed to. 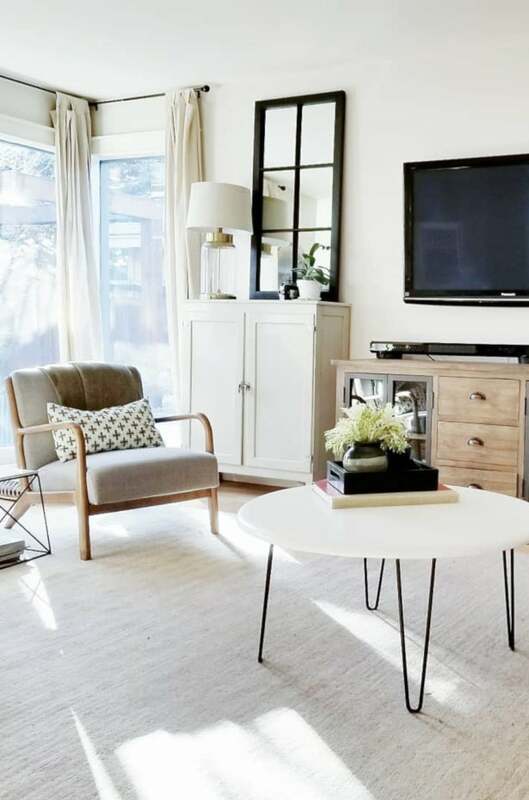 Don’t let your rug’s purpose overwhelm the room’s purpose. If you’re placing a rug in an office, make sure it has a low pile that won’t interfere with your rolling office chair. Use high-pile rugs in living rooms and dens with heavy furniture because they’re less susceptible to dents. They’ll protect your hardwood and can be easily fluffed when you rearrange furniture. A thick rug will also provide soundproofing, insulation, and cushioning. Get an area rug with a reliably dense, comfortable core that won’t bunch or wrinkle, but one that isn’t too bulky to prevent a good grip. Rugs with rough backings are bad news. If your rug has a seedy underbelly it can gradually scratch wood floors. Provide a barrier between your rug and the hardwood with a non-slip rug pad. In places where you do the most walking or standing, choose a carpet pad with a little bit of extra cushioning. For flat-weave rugs, try a discreet, dual-sided felt rug pad that reduces slippage. Synthetic rubber pads are the most inexpensive options and can easily be trimmed with scissors to fit rugs with irregular shapes. However, their dissolving agents might cause discoloration or leave marks that will have to be sanded and resealed. The toxins in a synthetic pad’s softening chemicals can eat away at your hardwood as they react to your floor finish. PVC or plastic pads are especially bad. You don’t want to buy a rug pad to preserve your floor only for it to do the complete opposite. You want your rug pad to mimic your floor: organic, natural, and smooth. Felt and rubber rug pads are best for hardwood. They’re clingy but because they’re not adhesive based, they’ll play nice with your floor finish and won’t hold odors. Still on the hunt for your area rug? Check out The Complete Rug Buying Guide to find a match for your hardwood floor.